Today the world marks the anniversary of the birth of Christ, but for the British royal family, there are other birthdays to remember as well. Two British princesses, one by blood and one by marriage, were also born on Christmas Day.One of them, Princess Alexandra, celebrates her 77th birthday today. But today, let's have a look at the jewels worn by the second: the late Princess Alice, Duchess of Gloucester. Alice eventually received even more jewels, further expanding the Gloucester collection. 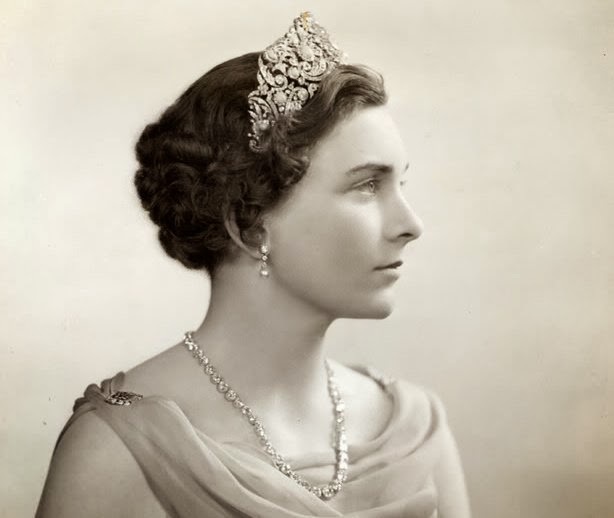 Queen Mary gave Alice another tiara, the diamond honeysuckle tiara made for her by E. Wolff & Co. in 1914. The tiara was made to have its central element swapped out for different pieces. 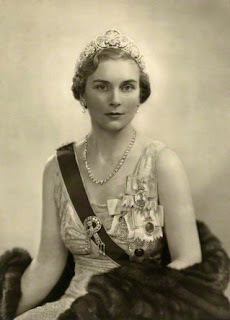 Queen Mary wore the tiara with the Cullinan V diamond; Alice, however, received the sparkler with a diamond honeysuckle element. When Queen Mary died in 1953, Alice inherited the pink kunzite stone that can be worn in the honeysuckle tiara. She also received yet another tiara from her mother-in-law's estate: the diamond Iveagh tiara, which Mary had received as a wedding present from the Guinness family. Alice's granddaughter, Lady Rose Windsor, wore this tiara at her wedding in 2008. 1. Cropped version of photograph available at Wikimedia Commons; source here. 2. Alice's cousin, Sarah Ferguson, also shares this royal lineage, as do her daughters, Princesses Beatrice and Eugenie of York. 3. The quotation comes from a Telegraph profile marking Princess Alice's hundredth birthday in 2001; source here. 4. See Ursula's website for more on Alice's wedding gifts. 5. A larger photograph of the brooch is available at Ursula's website. 6. See the Sotheby's e-catalogue here. 7. Photograph available at Wikimedia Commons; source here.